(CNN) It's never too late to graduate. That's the lesson World War II veteran Milton Mockerman shared with the Kalkaska High School class of 2017 with whom he graduated on Saturday. 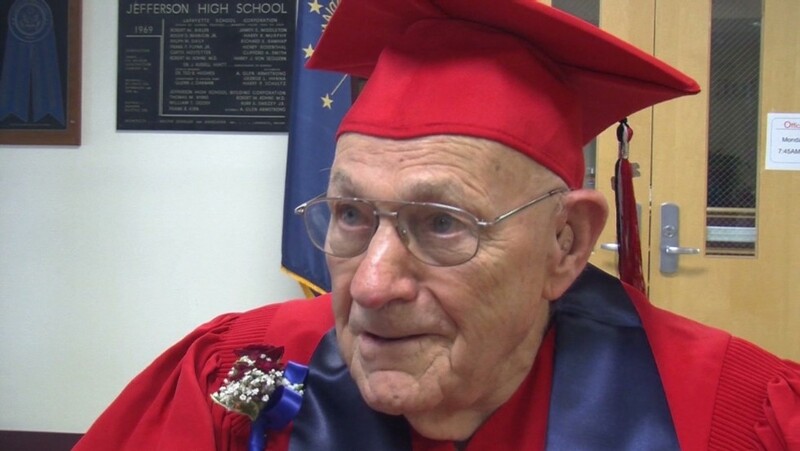 Mockerman, 89, received an honorary diploma from the school and participated in its graduation ceremony, fulfilling his lifelong dream of earning a high school degree -- 71 years later than expected. "We got a phone call from Milton Mockerman wondering if there were any classes he could take to finish his graduation," Kalkaska High School Principal John Sattler told CNN. Sattler soon learned Mockerman had forged his birth certificate and left high school early in order to join the Navy during World War II. After serving in the Navy for two and a half years, Mockerman returned home to Michigan and needed to find work. He worked a few odd jobs before going to work on the railroad for 31 years. After hearing Mockerman's story, Principal Sattler and his secretary wanted to help Mockerman accomplish his goal. They went to the board of education to ask if they could award Mockerman an honorary diploma. The board voted unanimously to do so. "Because of his years of service in the military, we ... gave him an honorary diploma," Sattler said. Before graduating with the senior class, Mockerman spoke to a few of the high school history classes about his experiences in the war. At the graduation ceremony, Mockerman received his honorary degree and said a few words to the graduating seniors. "I didn't know what to say, so I just kind of told them, 'Well, you've proved to me today that this high school graduating class must be smarter than I am,'" Mockerman told CNN. "Because what they took four years to do, it took me 71 years to come to that conclusion." Mark Mockerman, Milton's son, attended the graduation ceremony. "It was one of the greatest things I've seen," Mark Mockerman told CNN. "My dad hasn't had a lot of notoriety, and he deserves it, because he's been the kind of dad that everyone should have had. He's always there for me."